I was thinking about new tournament ideas, and this one came to me. This tournament is not about winning but surviving the longest. I am keeping it small the see how it goes. The game will have 16 players. Each the player will be randomly matched up in 1 vs. 1 game. (You could face the same player 2, 3, or even 4 weeks in a row. Not very likely however.) 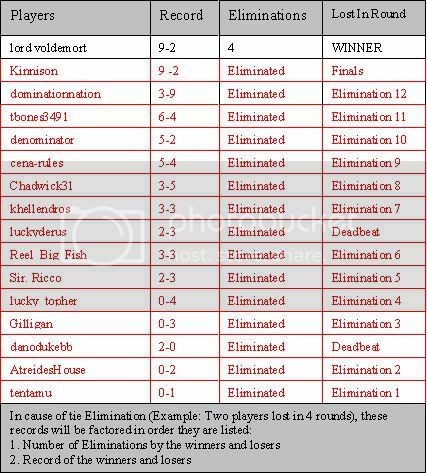 The player that loses the quickest (the least number of rounds) is eliminated. Now the winner of that match gets a week off (only when there is an odd amount of players). Week 2 will play the same as week 1 except one player gets to sit out. All odd weeks play the same (week 1, 3, 5, and ect.) and all even weeks will play the same (week 2, 4, 6, and ect.). Remember, itï¿½s not about winning but surviving the longest. Last edited by Sir. Ricco on Fri Feb 12, 2010 12:03 pm, edited 58 times in total. I'll play, but I'm thinking that if you have a long survival tournament, games are likely to take more than a week. denominator wrote: I'll play, but I'm thinking that if you have a long survival tournament, games are likely to take more than a week. I'll play it... Sounds like a good idea. Obviously, when you get to the final two, it will just be the winner of the game is the winner of the tournament, right? Chadwick31 wrote: I'll play it... Sounds like a good idea. Obviously, when you get to the final two, it will just be the winner of the game is the winner of the tournament, right? You like football? Pm me for Official NFL Reebok Jerseys!!!! Oh, ok I see what you’re saying. I should of made it more clears. It’s not how long you last time wise but round wise. 6 rounds are longer then 4 rounds. Also, it becomes important to watch other games in the tournament. once someone goes out for the 'tournament round', you just have to last to a later 'game round' than them. So a certain degree of hazardous play becomes acceptable. I think this is going to turn into a tournament of bogging down and defensive tactics... but what the heck, why not? I'm in. I think Alexander's would be a good map to play on. Classic is played on so much, and Doodle Earth is too small. Kinnison wrote: Also, it becomes important to watch other games in the tournament. once someone goes out for the 'tournament round', you just have to last to a later 'game round' than them. So a certain degree of hazardous play becomes acceptable. Good point. This is more of a test then anything. dominationnation wrote: can I play?